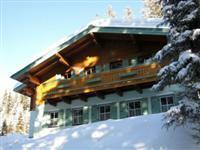 Strims is a beautiful, traditionally-built chalet in the idyllic World Cup Skiing town of Zauchensee. Inside, there are 6 self contained apartments, all different shapes and sizes and each sleeping between 2 to 7 people - or you can take all 29 beds if you want. Situated in the heart of the Ski Amade/Salzbugerland Sport welt area of the Austrian Alps, the location is fantastic; it's less than an hour away from Salzburg airport and gives you access to a huge range of skiing for beginners to experts alike. Zauchensee is one of Austria's top winter sports regions and is also a host to the FIS Skiing World Cup Tour. If you are interested in skiing, snowboarding, cross country/Nordic skiing, mountain biking, parapenting (paragliding) Strims is the perfect place for your winter break in the Austrian Alps. And, come the summer, Zauchensee is just as wonderful for mountain biking, hill walking, pony trekking, wakeboarding and nearby golfing or just relaxing in the sunshine and the clean mountain air. Strims is a beautiful chalet, situated on the south west side of the Zauchensee valley, surrounded by woodland, just 5 minutes walk (300m) to the village centre and the ski lifts, sitting peacefully on the mountainside. From the back of the house, you've got a choice of walking trails up through the mountains that can be enjoyed in summer and winter. The house is directly opposite the main ski slope and the town's small lake. And if you want to explore the region further, it's just a 2 minute walk to the free bus which gives you easy access to the nearest town, Altenmarkt, with its wide range of shops, facilities and other amazing ski areas nearby. To sum it up, the Strim ski apartment house in Austria offers you all the freedom of a self catering holiday, in a ski beautiful ski village with fantastic skiing - snowboarding that is close to Salzburg airport. And we are always on hand to help you make the most of your trip - everything from ski-guiding to restaurant recommendations. Strims is perfect for families, groups of friends or couples. Each apartment has either a kitchen diner or separate dining area. Each area can comfortably seat every occupant of the apartment and some even more.